Robert Thies (piano) and Damjan Krajacic (flute) form a duo that is in total sync spiritually and emotionally. That one factor to me equals a great listening experience. 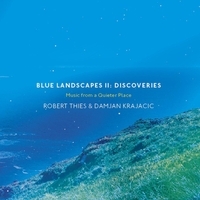 Blue Landscapes II: Discoveries was formed through inspiration from renowned classical composers such as Debussy and Ravel. The sessions that were recorded were improvisatory, which make the music that much more incredible and inspiring. This album is a continuation and expansion of the first volume. I was not fortunate enough to hear that first session, but I am sure it was quite good. The thought of these two men coming together and creating such beauty without a carefully mapped musical plan just amazes me. Some albums are done that way, and that is the norm. Regardless of how it was done, it remains totally intuitive for the listener. I found this to be an engaging journey for my mind, body and spirit. Yes, the triangle of life connects for me nearly instantly when listening to music like this. 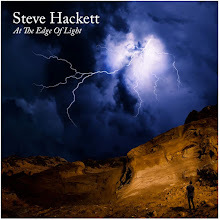 The album offers 15 tracks of peaceful meditation for your soul to assimilate. You can also use the music to travel to another plane of existence, a place that you know and are totally comfortable with. This music becomes your guide. As the CD cover says, it is “Music From a Quieter Place.” It is up to you to find it. Blue Landscapes can be the ocean, or the sky, or a blank canvas of blue, like watercolors of the mind, painted by the music directly into your mental and physical being. Each track is a separate path from the next, and they all weave together like a patchwork quilt that warms the spirit and holds memories. Blue Landscapes II: Discoveries is another doorway to tranquility created by two talented artists.